The other day we shared Jackie Robinson's Glorious Hummingbirds fabric collection with you. Today we're still focusing on Jackie, but we've shifted to a different season--get ready for Christmas with Father Frost! Just why did this master of floral fabrics (and now bird prints too!) turn her attention to all things Christmas with a collection featuring dazzling trees, ornaments and St. Nick figurines? In 2006, I enjoyed a spectacular trip to Russia with my cousin Doris. We took the River Cruise from Moscow to St Petersburg, with stays at both ends and various stops along the way. It was FABULOUS! We found the Russian people charming and gracious, and enjoyed visiting with them and learning that during the cold war days, they were as afraid of us as we were of them. The Architecture was AMAZING! 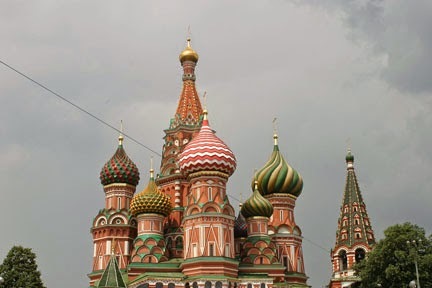 We toured the city of Moscow with several stops for museums and churches. Even on an overcast day the Domes at St Basil were outstanding. We went to the Bolshoi Ballet one evening. BUT - the highlight of Moscow was a meeting with Mikhail Gorbachev. As you can imagine, our Russian tour guides were excited beyond their wildest dreams. We'll never know 'why' we got this special audience with him, though the thought is he wanted to meet with some non-political Americans. 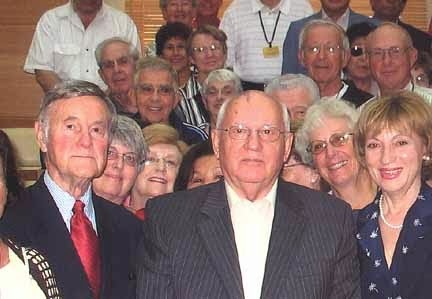 In this photo you see Mr. Gorbachev in the front center. See the man with the red tie on the left? I'm right behind his shoulder- glasses, grey hair. Doris is at the top of the photo, glasses and black & white jacket. The trip along the Volga was terrific, with lots of stops along the way. One of my favorite stops was in Kizhi. 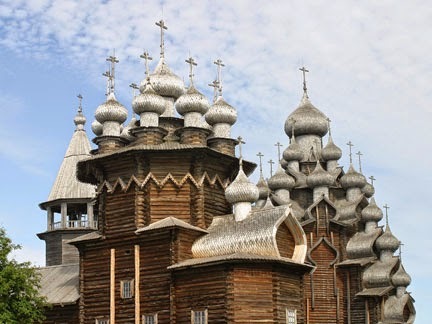 The roof and domes of this charming old church is all old and weathered wood. The sun is what makes it look like silver. 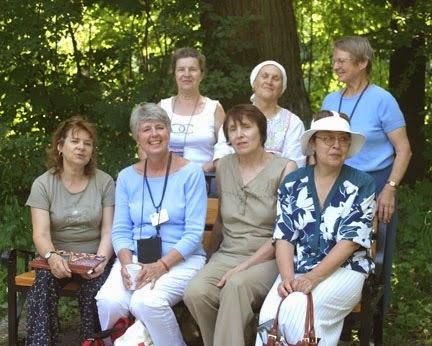 In St Petersburg we enjoyed all the typical sights AND I had pre-arranged a meeting with a small group of quilters. They were at the way opposite end of town - a long way away - so we took a young helper from the boat with us to not only navigate the subways to reach them, but also to help interpret our visiting. Our visit was great fun! They shared lots of quilts with us, and I had taken one, plus a great amount of fabric to give them. This photo hangs in my sewing room and I see it every time I pick up my purse. That's me in the front row, 2nd from the left. Doris is standing at the right end of the back row. I quickly fell in love with the painted Father Frost figures, and gathered a few along the way. I enjoy those wooden Father Frost figures each Christmas, and they, along with the designs painted on them, were the inspiration for this collection. It's the first time I've ever done Folk Art, and it was FUN! 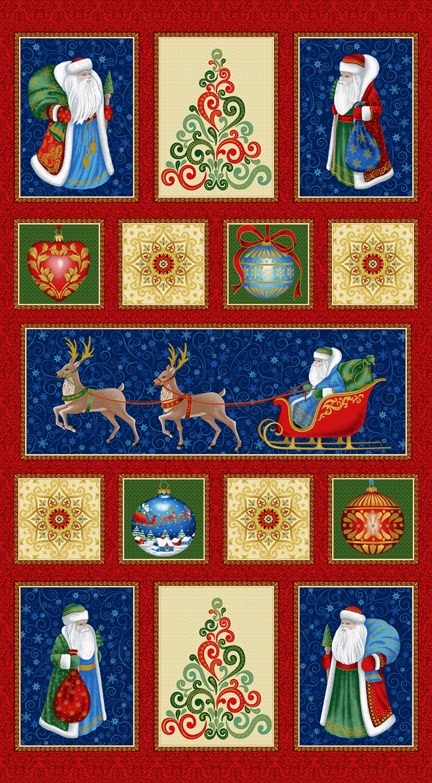 Click here to see the Father Frost fabrics. 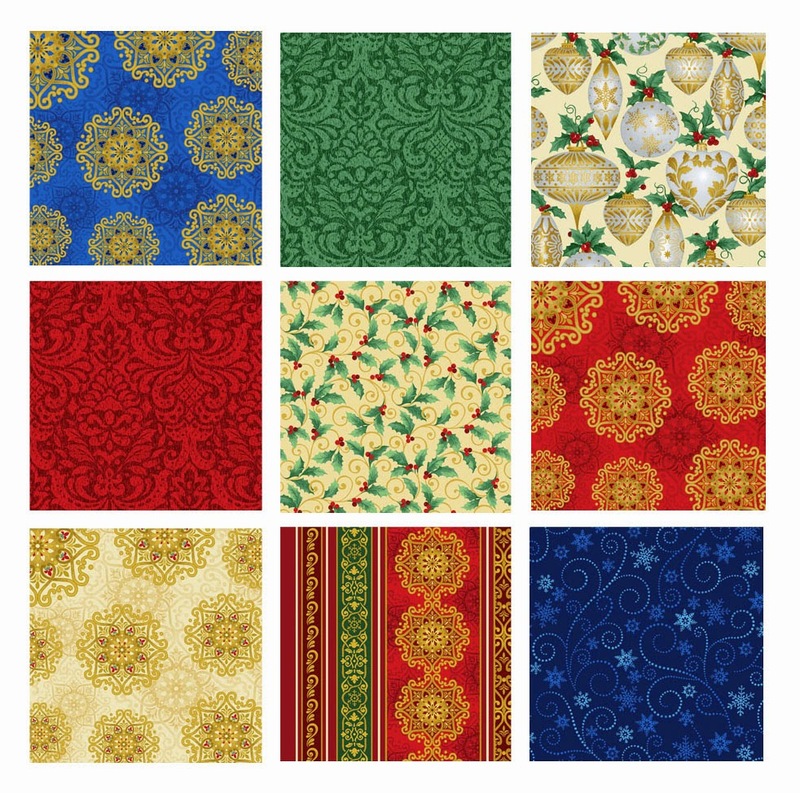 Click here to download a free pattern designed by Jackie featuring these fabrics. Click here to visit Jackie's website and see what else she has designed using Father Frost. I've always wondered where the idea for the mushroom/onion dome shape came from. It and the pomegranate shape are unique. 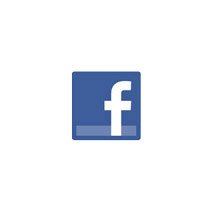 How can you look at that chubby cheeked guy above and not smile?